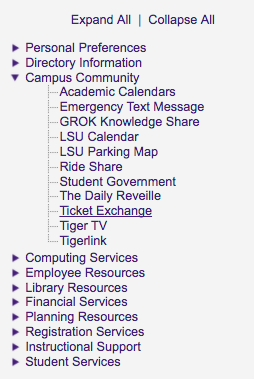 Ticket Exchange on myLSU allows students to post information on tickets for sale or to post a message stating a desire to purchase tickets for a certain event. Individuals are responsible for all transactions, payment, and contacting one another. 3. Click Student Ticket Marketplace. NOTE: It is illegal in Louisiana to sell tickets for more than the price printed on the ticket.